I have mentioned Travelpony before as I really like their deals and sometimes they offer much better rates than what is available on other websites. I have found the Jumeirah Towers in Dubai, Waldorf Astoria in the UAE and London hotels for up to 40% discount on what is openly available. Many emailed me during the past week asking about hotels in London and UAE and if I know any good deals as part of their EID travels. My reply to all of them was check Travelpony as they do offer good deals sometimes. Travelpony is offering a mystery bonus with the code JULYMYSTERY once you go to the payment page you will find the bonus. It is approximately 8% off the advertised price. This is only available until 10th of July so you must be quick! What makes this even a better deal is the fact that with my referral link (I will be delighted) you can receive $35 extra discount. You can use my link here. Another great point with Travelpony is that many of their rates are refundable, so you can book and cancel up to 2 days before your arrival in case you find a better deal somewhere else. 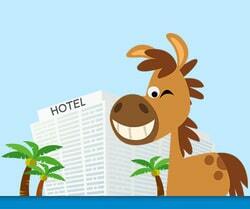 Always check and compare prices between any hotel or online agent website. I hope you take advantage and I would love to know your Eid travel plans, so share below. p.s. If you book via my link you will receive $35 discount and I will receive $25 after you complete your stay. If you would like to support please use my link.